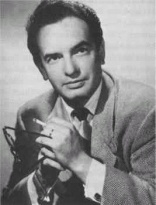 Lewis was often known as Mr. Radio. His career over the air was multi-faceted and has left an indelible mark. He was a talented dramatic actor. He played Captain Philip Kearney in the well-remembered Voyages of the Scarlet Queen. He also took his turn as a radio detective in both The Casebook of Gregory Hood and played Archie Goodwin in Mutual’s Amazing Nero Wolfe, and then starred with his then-wife Cathy Lewis in On Stage which pushed him into a wide variety of genres. He was also a great comic actor, providing fantastic character work on Burns and Allen, in addition to enjoying a memorable recurring role on the Phil Harris and Alice Faye show. Yet, with all that said, Lewis did not particularly enjoy acting. He wanted to produce and direct radio. In the 1950s, this happened as he served as producer/director of Broadway is My Beat, a program that captured the full flavor of New York’s diverse population and where characters often spoke in memorable and brooding poetry. He took the helm at Suspense and pushed the show in different directions including adapting Othello and the Moonstone in multi-part episode, doing a two part episode that proposed an ending to Charles Dickens’ unfinished novel The Mystery of Edwin Drood, and giving guest spots to comedy actors like Bob Hope and Jack Benny who rarely got dramatic roles. While he worked in television, his dedication to radio and his reputation for excellence continued. When Rod Serling experimented with radio drama in 1973 with his Zero Hour series, Lewis once again found himself as producer/director. And he also got the call for 1979’s Sears Radio Theater. Elliot Lewis, a talented actor, and great producer of radio dramas well deserves his ranking as one of radio’s ten most essential people.